On the afternoon of April 11, 2019 local time, Premier Li Keqiang met in Dubrovnik with Prime Minister Marjan Sarec of Slovenia, who was here for the summit between China and Central and Eastern European Countries (CEEC). 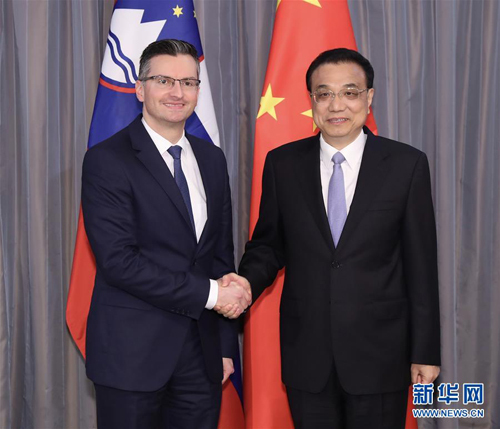 Li Keqiang said that as important cooperation partners, China and Slovenia enjoy sound and stable development in bilateral relations and cooperation. The two countries can complement each other's strength and have achieved a series of cooperation results in various fields. We are willing to better align the Belt and Road Initiative with the development strategies of Slovenia, and further deepen cooperation in such areas as innovation, technology and small and medium-sized enterprises. Marjan Sarec expressed that Slovenia and China are important cooperation partners, and have maintained frequent high-level exchanges, adding that bilateral relations and cooperation in various areas have seen smooth development. The Slovenian side is an active participant in the joint construction of the Belt and Road Initiative and China-CEEC cooperation, and is willing to expand cooperation with the Chinese side in trade, investment, science and technology and pharmacy so as to promote new progress in bilateral relations.